By Matt Free Posted 21/03/2013 under General. So last night I found myself in a bizarre yet extremely positive position for Peterborough. I was in a pub, in a room full of geeks, listening to people talk about agile development practices. 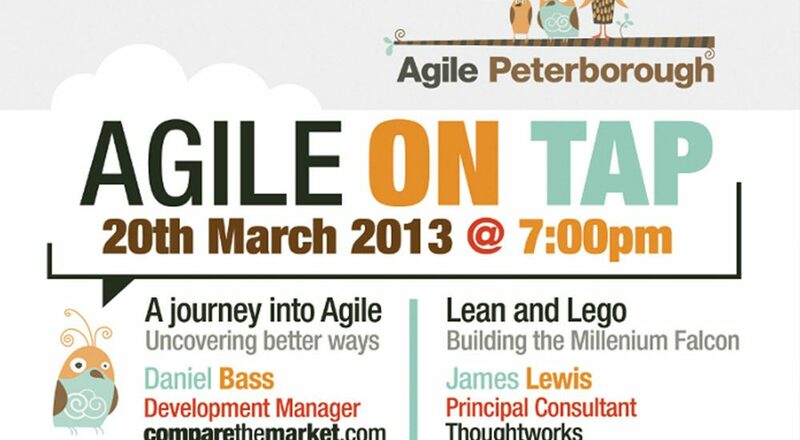 #AgileOnTap was organised by local Agile Evangelist Alex Shaw as part of Agile Peterborough, who (with some collaboration from the local dpip guys) organised a couple of great speakers and quite the crowd to listen to them. Kicking off with local Developer/BGL Dev. Manager Dan Bass who took us through the comparison of 2 projects built under different workflow methodologies, 1 agile and 1 more traditional, and the experiences/ramifications of both. An interesting talk that highlighted the benefits of agile, to the business, the teams involved and most importantly the end user. Dan did a great job of demonstrating the differences of the 2 methods without getting too techie and also managed to highlight that it is possible to make the transition from non-agile to agile in a relatively short space of time (albeit as long as you’re in the right environment). Next up we had ThoughtWorks Consultant James Lewis taking us through how he and his gradually self-organising team managed to build the Millenium Falcon, out of lego, in an ever decreasing amount of hours. How they managed to come up with increasingly better methods of working by analysing the actions they were taking, breaking them down and putting them into parallel non-blocking streams. He managed to throw in a good amount of Star Wars references (with slides in the right font) whilst also talking us through some of the underlying Lean principles that can be used to gradually refine a workflow into a more efficient workflow/s. Agile on tap was a great event and I’ll definitely be attending it and Digital People in Peterborough whenever possible from now on.